Magnolia Starbright is one of the best evergreen magnolias for use as a screening plant or flowering hedge. It has a fast growth rate, is easily pruned and with masses of flowers from early spring to summer also makes an excellent specimen plant in the garden. This is Michelia doltsopa, Yunanansis hybrid, and it take some great characteristics form each parent. The flowers are larger than those of Yunanensis and seem to last longer than this of the Michelia doltsopa. Growth rate is fast, so you can establish a 3 metre screen in just a few years. The plant will be better formed if pruned form an early age. Pruning helps develop a bushier habit and promotes more flowers. This is a free flowering plant, masses of felty brown buds are followed by the open starry white flowers. The flowers themselves have a citrus perfume. This is a long flowering variety with a show of flowers for up to 8 weeks. 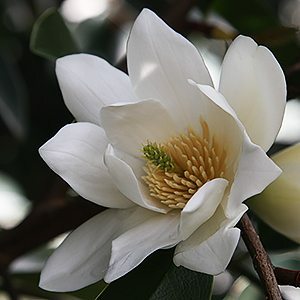 One of the best white flowering Magnolias for an evergreen screen, hedge or even an espalier. Easily pruned to shape and size. The best time to prune is just after flowering. Height – Will reach 3 – 4 metres over 5 – 6 years. Easily pruned to around 1 metre. Position – Full sun to afternoon shade. Flowers – White in late winter to early spring. Planting distance – space at 1 metre for a good tight screen or hedge.